As more people bought cars in the early 20th century, vacation camping became a popular pastime. The Magers family, German immigrants who settled in this area, opened part of their land for camping in the 1920s. The cool, clear waters of the river and the beauty of the canyons made this an ideal campground. Local citizens acquired land and enlisted the Civilian Conservation Corps to build the park. After construction was completed, the park was donated to the state. The park opened June 1, 1941, and was named for John Nance “Cactus Jack” Garner. Garner was a Uvalde native who served as vice president of the United States from 1933 to 1941. 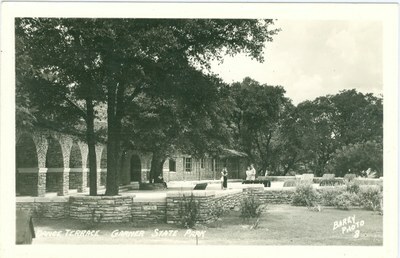 Postcard, dance terrace, circa 1941. With the onset of the Great Depression in the 1930s, the nation faced a terrible unemployment crisis. With more than half of young men under 25 out of work, President Franklin Roosevelt created the CCC to provide jobs. Under the program, young men developed national and state parks, as well as rehabilitated forests and controlled soil erosion. CCC Company 879 developed Garner between 1935 and 1941. Projects at the park included roads and culverts, foot trails, a lodge and cabins, service structures, picnic tables and benches, and the combination building. Combination Building: The CCC utilized native limestone and hewn bald cypress to construct this building and dance pavilion. The building overlooks the river, and is the centerpiece of the park. Dancers gather on the pavilion in the summer, as they have for decades. A New Deal for Texas Parks. For thousands of years, the Frio River has enticed people to its banks. Between 10,000 and 12,000 years ago, prehistoric people camped in the area. 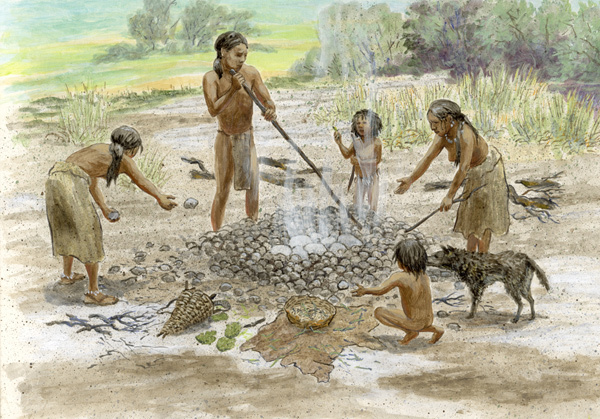 They came here for the abundant game, useful plants and stone for making tools. In addition, the river provided a dependable source of water and helped cool the canyons. As early as the 16th century, Spanish explorers made entradas (or entries) into the Americas, bringing horses with them. The Comanche and Apache quickly became horsemen; the Comanche were especially adept. This ability gave them an edge over other Native American groups in the area. Native Americans roamed this area into the mid- to late-1800s. In the 1850s, Anglo settlers began trickling west of San Antonio. These self-sufficient and daring folks farmed; raised cattle, hogs and goats; grew tobacco, cotton and corn; and produced tallow and hides. They harvested the local bounty of pecans, game and other resources, just as earlier peoples had. Two German immigrant families, the Magers and the Streibs, settled on land that later became Garner State Park.